I found this little friend lying unwanted and greatly reduced in the Music and Video Exchange, but I can't seem to find a single scrap of evidence online or offline about who the Leer Bros. Band were (although we can hopefully safely say without fear of casual libel that they were indeed brothers with the surname Leer). What I can find, however, is a ton of collector's sites not reaching any general consensus on the type of music they play - I've read this described as "garage pop", "a mod dancer", "bubblegum" and even (wildly inaccurately) "soul/ funk" across several different sites, which means they're either a supersonic, groovy kind of multi-genre family band, or else a bunch of second-hand record traders are just telling potential buyers what they think they want to hear. Sadly, I think it's the latter. Still, don't surf away just yet, because "Mystery of Love" is actually pretty good. I'd categorise it as being sixties guitar-based pop, in honesty - it doesn't have enough grit or rawness to really be referred to as "garage" - but a compelling, Keith Richards-esque riff and chipper groove makes it sound very much like Crazy Elephant's "Gimme Gimme Good Loving" with a tiny bit more spittle. And yes, I'm well aware that Crazy Elephant's track is frequently categorised as bubblegum, but I've never quite been happy with it resting in that category, especially as its B-side is a gut-churning piece of psychedelia I really must upload sometime. This also sounds as if it might have been a hit single if the winds had been blowing a bit fairer for it on the week it was released, but its obscurity is now such that if you look on Last FM, it has yet to generate a single play. Trust me, that's as obscure as old singles get in these days of file sharing, mp3 blogs and re-issue labels. If anyone has any answers as to who the Leer Brothers were, and what else they did (if anything), they'd be gratefully received as always. You are closer than you think with much of your speculation. Take a bow. The Leer Brothers are a slippery bunch. They spun off from Mel Wynn and The Rhythm Aces (Google: Mel Wynn). A kid from New Zealand (ABS) had a hit with a sampled version of a "hit" Jay Leer/Mel Wynn song titled "Stop Sign". Caution: it has a catchy hook that will sneak into your brain at odd times. 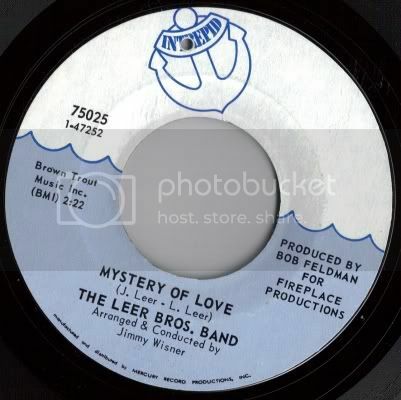 The Leers Brothers were once signed to Mercury and subsequently dropped with a roster-cleaning that included David Bowie. Jay was a Mercury A&R for a couple of years while with the band. His close and respectful association with Charlie Fach allowed him to work on the release of "Maggie May", mix the Chuck Berry Live in London Sessions LP, and produce a version of Gunhill Road's "Back When My Hair Was Short" and John Van Horn's "Mountain Music" LP. It also allowed the Brothers a lot of studio access. The Leer Brothers Band released "Take You Down" b/w "Billy Bam Bam" on Buddah in 1976. The 45 is a study of contradiction. The promo department convinced the label to rename them "Freedom" and try to glom onto the Centennial celebrations. Generally considered a mistake but knowing the Brothers wrote and recorded "Hot Pants" as "Salvage" and are reported to have done some tracks for Kasenetz-Katz, it is not like they had to have their arms twisted. The majority of their work can be found on the 1999 CD "Better Late Than Never". When Googled, more and more videos and hits are returned. They are very interesting. The Leer Bros. Band was known in the record business as The Kings of the SecondaryMarkets! Mystery of love was #1 in 21 secondary markets and sold 50,000 copies but never made it past the bottom of the ntional charts. Thanks for all the information, this is really interesting stuff. I frequently feel sorry for American bands who managed to do well only in certain regions, and there seem to be so many examples of the phenomenon out there as well. Didn't Robert C. "Bob" Feldman produce (or write) The Strangelove's "I Want Candy"?! 23 Daves, check out youtube (usa) and search "Leer Brothers Band". Looks like stuff is getting posted. Blimey, stuff does indeed seem to be making its way on to YouTube, including them doing a cover of The Standells "Dirty Water" at a school gig earlier this decade. I can only assume that one of the Leers (or at least their agent) has a YouTube account. It would seem as if they had enough of a profile that they shouldn't have been a total mystery to me, but hey ho. Who IS THIS Jay Leer? Thanks for the heads up Dave 23! They are brothers but their last name is Sechler - not Leer. Larry Sechler lives on Penn lake in north-east Pennsylvania. The drummer AKA Twiggy lives in Tampa Fl. - Don't know about the other two. This is a rockin' site ... love the obscure.